Waterford Institute of Technology (WIT) recently hosted a ‘Metal 3D Printing – Additive Manufacturing Laboratory’ with the potential to revolutionise manufacturing in Ireland. Metal 3D Printing Additive Manufacturing is a new and exciting technology which offers many advantages over conventional manufacturing methods. Metal laser sintering technologies are used to develop more complex components, streamlining the manufacturing process by removing multiple process steps, reducing materials handling and the number of components in an assembly, as well as enabling rapid prototyping of functional metal components. 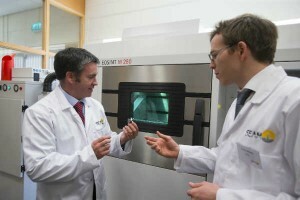 Ireland’s first production scale EOS 3D metal printer and post-processing accessories, is located in the South Eastern Applied Materials (SEAM) research group at the Waterford Institute of Technology. The 3D Printing lab and the future research opportunities it offers brings enormous potential to engineering and manufacturing industries in Ireland. Irish Industries such as Mann Engineering Ltd. are well aware that this technology is destined to transform the manufacturing industries of the future, and are taking steps to use advances in industry technology to maximise their competitive edge and apply the best practices of lean manufacturing principles. SEAM, South Eastern Applied Materials (SEAM) research group provide strategic research expertise to companies interested in this new and exciting manufacturing technology and a comprehensive support to companies wishing to adopt lean manufacturing techniques and stay competitive in the manufacturing and engineering industry.